John Yuill was born in 1934 in Boswell, Indiana. 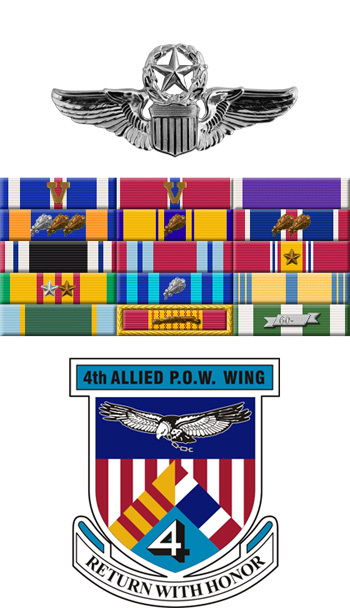 He enlisted in the Aviation Cadet Program of the U.S. Air Force for Navigator/Basic Observer training on February 8, 1954, and was commissioned a 2d Lt and awarded his Navigator Wings on April 7, 1955. His first assignment was as a navigator with the 1708th Ferrying Group at McClellan AFB, California, from April 1955 to February 1958, followed by pilot training from February 1958 until he was awarded his pilot wings at Vance AFB, Oklahoma, in June 1959. Lt Yuill then completed F-86 Sabre Combat Crew Training before serving as an F-86 pilot at Perrin AFB, Texas, from December 1959 to February 1960, followed by B-52 Stratofortress Combat Crew Training from February to May 1960. His next assignment was as a B-52 pilot with the 26th Bomb Squadron of the 11th Bomb Wing at Altus AFB, Oklahoma, from May 1960 to January 1967. He then completed B-58 Hustler Combat Crew Training before serving as a B-58 pilot with the 366th Bomb Squadron of the 305th Bomb Wing at Bunker Hill AFB (renamed Grissom AFB in May 1968), Indiana, from March 1967 to June 1969, followed by service as a B-58 instructor pilot with the B-58 Combat Crew Training School at Grissom AFB from June 1969 to April 1970. After completing C-130 Hercules Combat Crew Training, Maj Yuill served as a C-130 pilot with the 776th Tactical Airlift Squadron at Ching Chuan Kang AB, Taiwan, from June 1970 to August 1971, during which time he flew 68 combat missions in Southeast Asia. He then served as a B-52 pilot with the 20th Bomb Squadron of the 7th Bomb Wing at Carswell AFB, Texas, from August 1971 until he was forced to eject over North Vietnam while on temporary duty to Southeast Asia on December 22, 1972. After spending 98 days in captivity, Col Yuill was released during Operation Homecoming on March 29, 1973. He was briefly hospitalized to recover from his injuries at Sheppard AFB, Texas, and then attended Air War College at Maxwell AFB, Alabama, from August 1973 to July 1974. His final assignment was as Deputy Base Commander at Carswell AFB from July 1974 until his retirement from the Air Force on April 1, 1979. 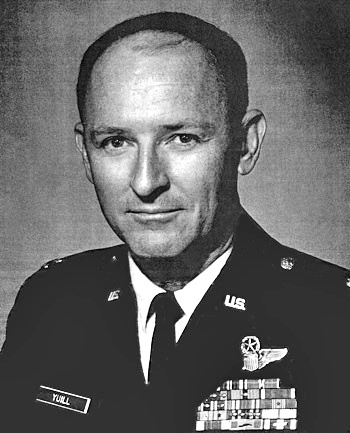 Lieutenant Colonel John H. Yuill distinguished himself by heroism while participating in aerial flight as a B-52 Aircraft Commander over Southeast Asia on 21 December 1972. On that date, Colonel Yuill participated in high-priority bombing missions against vital military targets in heavily-defended areas of North Vietnam. Despite the intensity of defenseive reaction and the extreme hazards posed by numerous surface-to-air missiles and hostile interceptors, Colonel Yuill displayed courageous willingness to place the mission above his personal safety in directing his aircraft to a successful release of its ordnance on the designated target. The outstanding heroism and selfless devotion to duty displayed by Colonel Yuill reflect great credit upon himself and the United States Air Force.